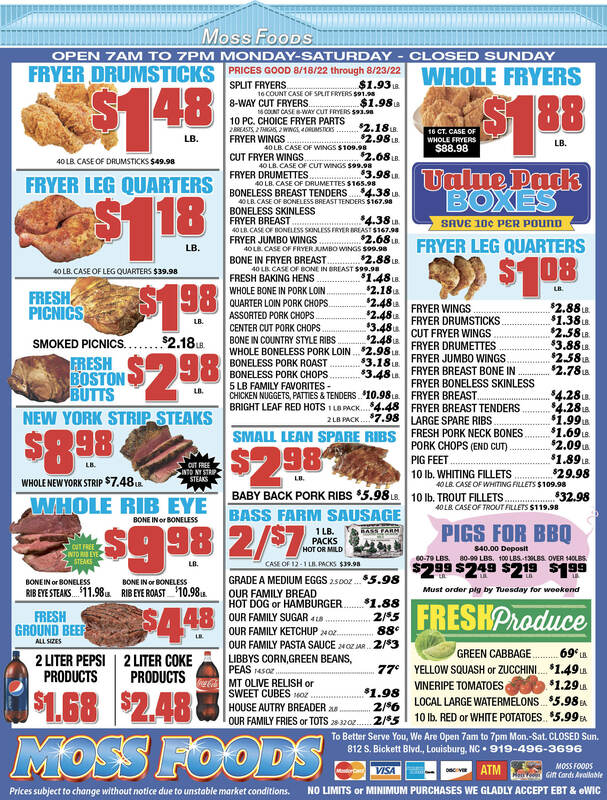 Showing 41 articles from December 2, 2015. LOUISBURG -- The filing period for the 2016 primary opened with a flurry on Tuesday, and if incumbents seek re-election, there will be races for the North Carolina State Senate and Franklin County Board of Education -- with perhaps more to come. What won't come is a re-election bid by District 5 Commissioner Don Lancaster, who announced early this week that 2016 will be his last on the board. "I've served three terms and then I've been on the school board," Lancaster said. COMMUNITY TRADITION. 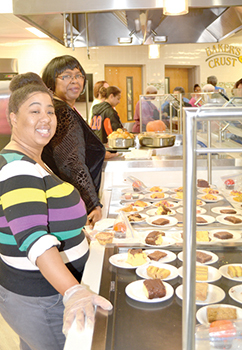 A local group, A Blessing, Inc., has created a Thanksgiving tradition over the last few years by holding a huge Thanksgiving dinner for those less fortunate at the Louisburg College dining facility. Helping make the event possible are a large number of dedicated volunteers who tackle just about every task possible. In the photo (left), Venita Edgerton (left) and Barbara Edgerton were serving a huge variety of desserts. This year, 27 turkeys and nine hams were cooked -- as well as an untold number of side dishes and desserts. FRANKLINTON -- The Environmental Protection Agency called for fuel companies to blend a higher amount of biofuels into gasoline next year, but it's not as much as was expected under a plan to cut back on the country's reliance on fossil fuels. 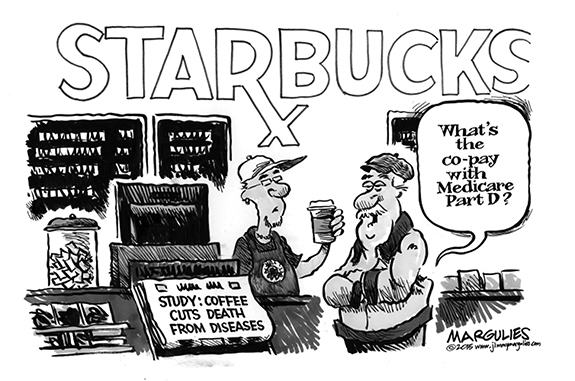 And it wasn't enough to make a local biofuel industry leader happy. "[This week] President Obama told the world that 'addressing climate change takes all of us, especially the private sector going all-in on clean energy worldwide,'" said Novozymes President Adam Monroe. 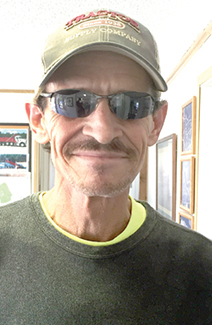 LOUISBURG -- Kent Winstead isn't vain, but appearance matters. How his officers appear when they respond to a call is important -- many of them are equipped with body cameras so there is an objective view about how they interact with the public and do their job. How his officers appear on the roads is important: the department has purchased GPS units and, once activated, will keep track of an officer's whereabouts and travel speed. Finally, a little progress on 401 or so we can hope! Here's hoping that you and yours had a happy, fun and filling Thanksgiving holiday this year -- and that everyone survived the post-holiday shopping insanity without serious injury to self or bank account. None of us could have asked for nicer weather than we enjoyed, although it seemed a little out of character for late November. But, as my late mother would have noted, every day this time of year with temps in the 70s and clear, blue skies, is another day closer to spring! As we barrel toward the end of the year, it's time to take a deep breath and focus. 2) The risk of being intimidated by the obstacles and missing out on a once-in-a-lifetime opportunity. As everyone knows, Novant Health has left Franklin County for reasons that don't matter much anymore. Ah, what a difference six months can make. Back in July, the sun was out. The air was warm. And, for the most part, candidates for municipal elections, or interested voters for that matter, were nowhere to be found. In December, the sun can't be found. The air is cold and the ground is damp. A budget is a massive piece of legislation in which much can be secreted. Last week, the Associated Press peeled back another layer in the onion (think: stinks) that is the Wrecking Crew in Raleigh's latest fiscal boondoggle. The Republican-controlled General Assembly set aside $8 million to pay outside law firms to defend the laws it passed. Keep in mind, this is in addition to the North Carolina Attorney General's office, which Tar Heel taxpayers already pay for. In my resting moments, I think of my friend, Fred Johnson, who died Oct. 29. Most everyone in the county knew Fred. And so did folks in and around Myrtle Beach and Reidsville, where he had also lived and worked. Here in Louisburg, we knew him as the owner of a Dairy Queen, later as publisher of the family-owned Franklin Times, later as the owner of the Sears store. BUNN - Carolyn Jones Game, 77, of Bunn, passed away Tuesday morning at Edgewood Place in Burlington, NC. HOLLISTER - Funeral services for Helena E. Richardson, 84, who died Sunday, Nov. 29, 2015, will be held Friday, Dec. 4, at 11 a.m. at Pine Chapel Baptist Church, with the Rev. Linwood Richardson officiating. Burial will follow in the church cemetery. GONE AGAIN. Bunn's Tevin Perry escapes for a touchdown during last Friday night's home playoff victory against the East Duplin Panthers. BUNN -- As he walked off a frigid field in Reidsville back in 2005, Coach David Howle wondered if his Bunn Wildcats would ever make it back to the Final Four of the Class 2-AA State Football Playoffs. After all, that was the first time Bunn had traveled that far in the postseason, only to fall to a loaded Reidsville contingent that eventually won the state title. Howle would retire four years later, then unretire in 2013, all the while hoping his program had one more magical run left. ANDREAS ALL THE WAY. 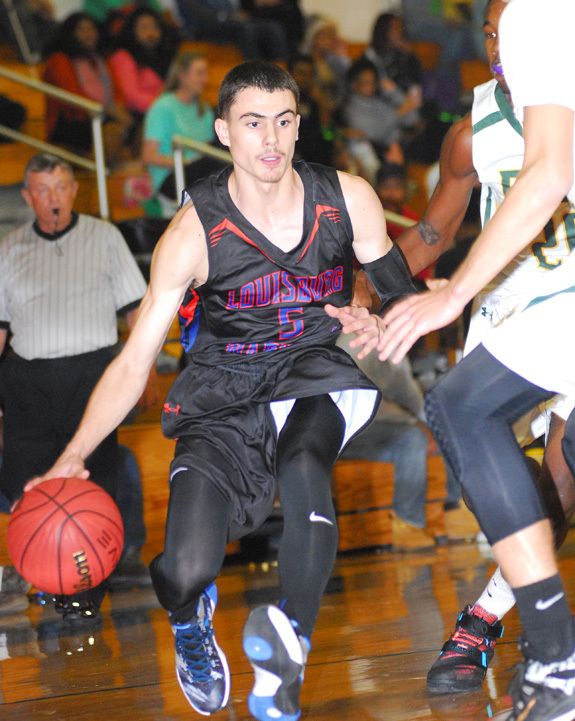 Louisburg's Andreas Wilson (with ball) drives for two points during Tuesday's road hoops decision against rival Bunn. BUNN - Mike Sheldon's first victory as Louisburg High School's boys basketball coach came against a familiar opponent. Bunn, of course, is Louisburg's top rival, but it's also where Sheldon previously worked as the successful skipper at Bunn Middle School. Sheldon eventually came to LHS as an assistant principal before opting to return to the classroom. And his teaching abilities were certainly in evidence last year when he led the Lady Warriors to the Tar-Roanoke Athletic Conference championship. A TIME OF REFLECTION. 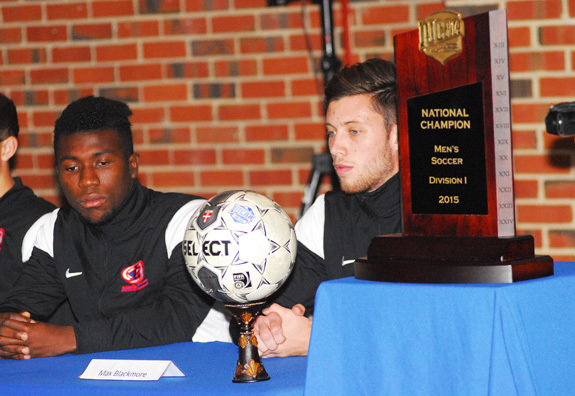 (L to R) Louisburg College players Alex Kao and Max Blackmore listen to comments during Tuesday afternoon\'s celebration to commemorate the school\'s men\'s soccer national championship. LOUISBURG -- Fitting that Max Blackmore would be seated right behind the game ball -- and beside the National Junior College Athletic Association National Championship plaque. Blackmore and the ball have met before -- it was redirected by his foot and into the back of the net to finish off Louisburg's 1-0 victory over Tyler JC on November 21 in the title matchup of the NJCAA National Tournament. WALL'S WAY. 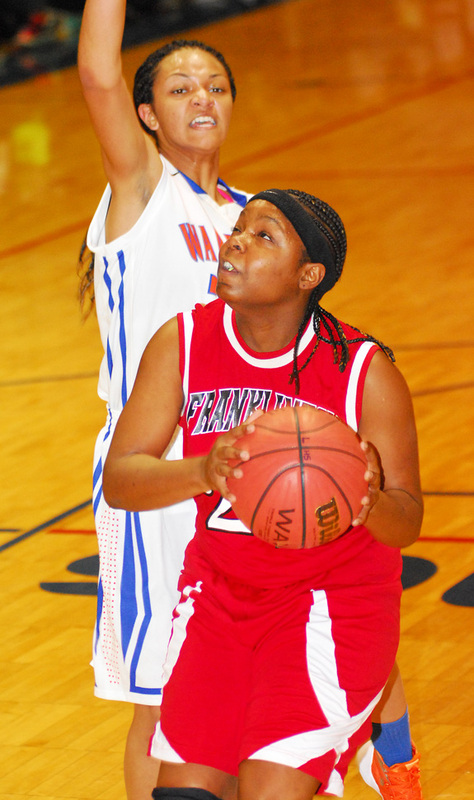 Franklinton's Tanisha Wall (with ball) scores in the paint against rival Louisburg HS. LOUISBURG -- Franklinton High School spent most of the 2014-15 girls basketball season with only six players -- but still competed for a top-half spot in the Northern Carolina Conference. Veteran FHS coach Lester Wilder is happy with his club's new look, which features a deep bench to go with five returning starters from last year. Franklinton showed off its newfound depth last Tuesday during a convincing 47-17 road decision last Tuesday against Louisburg in a game that was staged at Taylor Center on the Louisburg College campus. BUTTERBALL IS BACK. 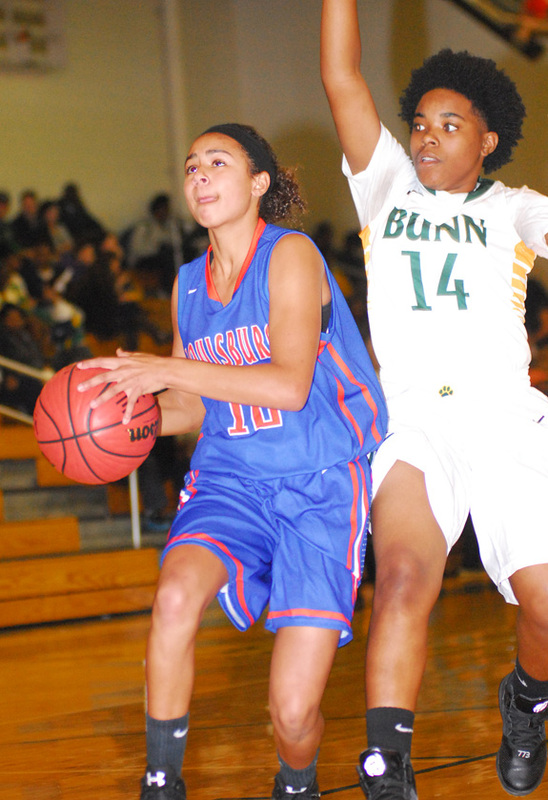 Point guard Bernadette 'Butterball' Cooke returns for the Bunn girls basketball squad. 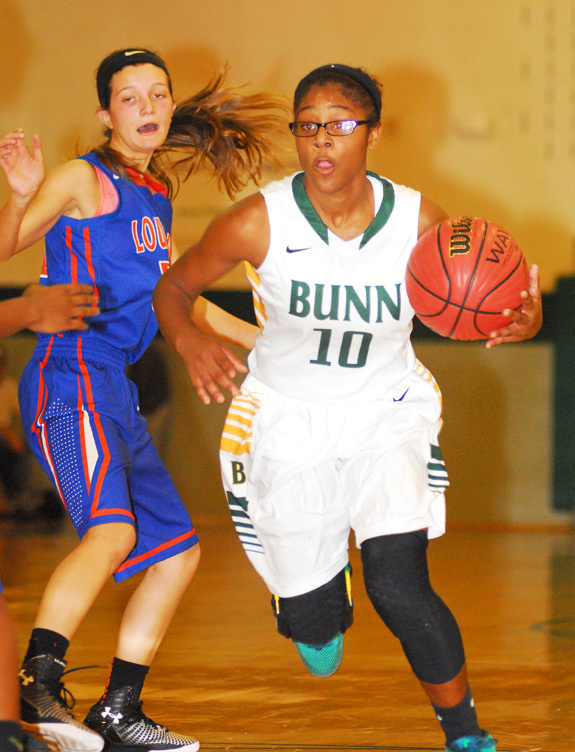 BUNN -- Bunn lost just one starter from last season's girls basketball team, which dropped just one contest the entire campaign while reaching the third round of the Class 2-A State Playoffs. But what a starter she was as Tainasha Vines was the Northern Carolina Conference Player of the Year for the second consecutive time en route to garnering State Athlete of the Year honors. CLEARING A PATH. Franklinton's Jerrail Brodie (with ball) drives against Louisburg's Kenan Epps during last Tuesday's prep basketball showdown. 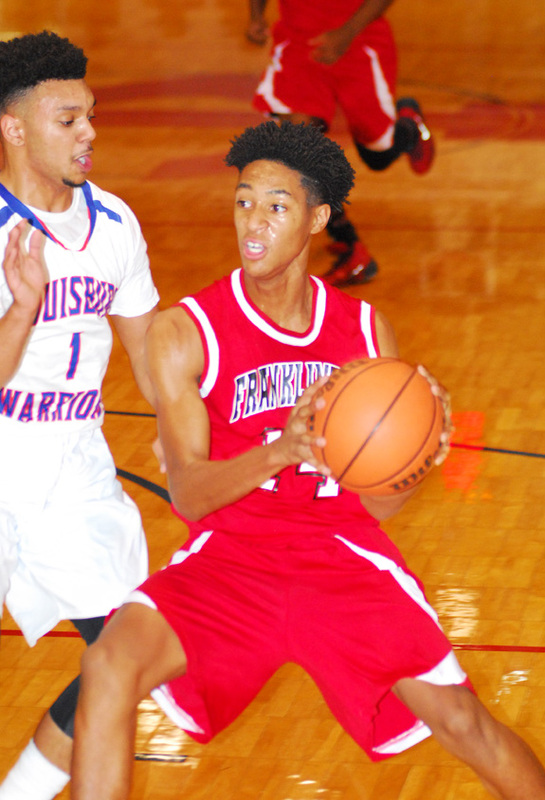 LOUISBURG -- Leading by one point at the break, Franklinton picked the perfect time to put together its best period of the young season during last Tuesday's rivalry boys basketball showdown against Louisburg. The Red Rams were effective on both ends of the court during the decisive third frame and went on to defeat Louisburg by a 66-46 margin in front of a huge crowd at Taylor Center on the campus of Louisburg College. CHAPEL HILL -- Olivia Smith of Cardinal Gibbons High School in Raleigh and Tevin Perry of Bunn High School have been named winners of the NCHSAA Performance of the Week Awards. Each week, two athletes in North Carolina High School Athletic Association competition, one male and one female, are selected for this award from nominations received from media and school administrators. 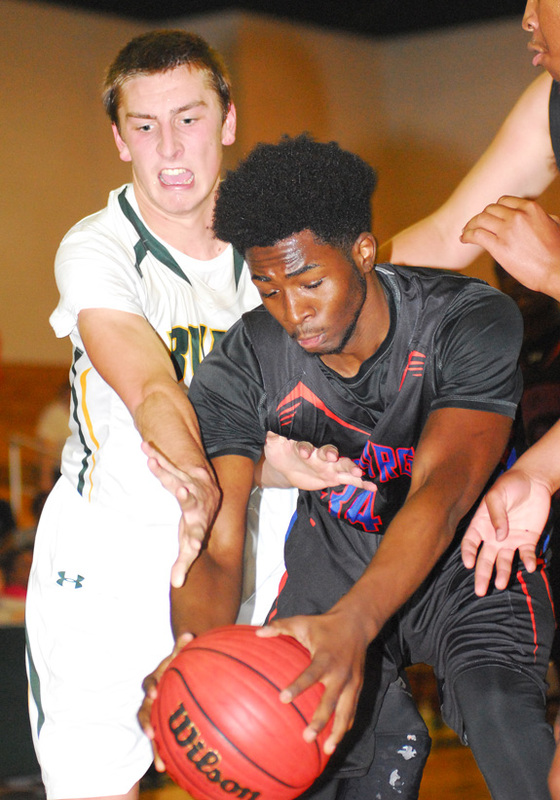 HENDERSON -- The Kerr-Vance Academy varsity boys basketball team played their most complete game of the season last Monday evening, defeating Grace Christian of Sanford by a 73-45 total. Grace Christian played strong throughout the first period, taking an early 14-11 lead. However, from there it was almost all Kerr-Vance. TWO FOR TAKEDOWN. Louisburg's Amador Castro takes charge of his match against Greene Central as part of last Tuesday's wrestling tri-meet at Nash Central High School. LOUISBURG -- Louisburg High School's wrestling squad returned to the mat last Tuesday to participate in a tri-meet against Greene Central and host Nash Central at the NCHS Gymnasium in Rocky Mount. 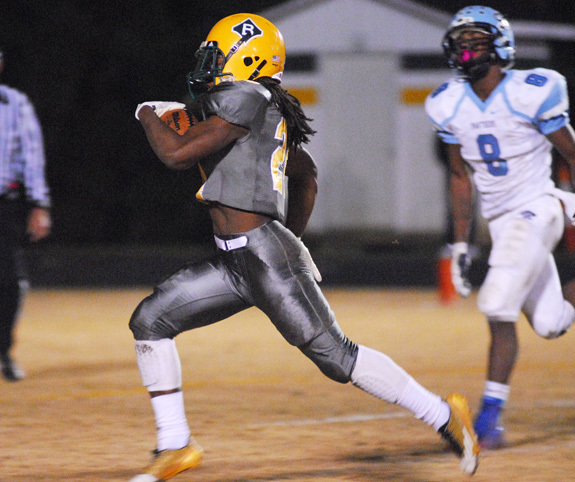 Against Nash Central, the Warriors were edged by a 34-24 margin. Louisburg was also defeated by Greene Central at the event. TRUE CHAMPIONS. 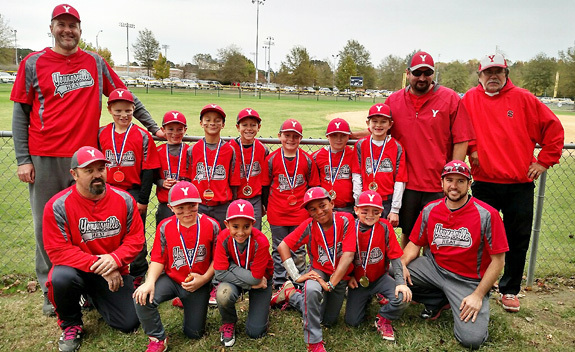 The Youngsville Heat 8-Under Select Team claimed the championships at the NC AAU Super State Tournament in October in Oxford and the TSL Gold Bracket Select Tournament in November in Smithfield. 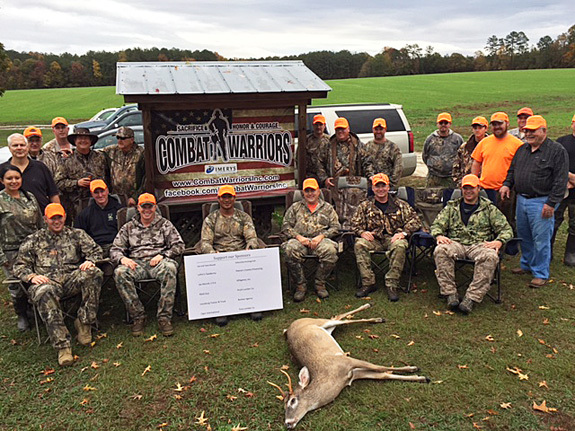 FRANKLIN COUNTY -- A Combat Warrior Pleasants/Farmer Deer Hunt was held Nov. 6-8 and was hosted by Franklin County for the fifth consecutive event. Most of the Warriors came to the Franklin County cabin that Friday afternoon. They received a warm greeting, picked up their gifts, signed in and met their guides. The warriors and guides all were excited about the weekend hunt, shared hunting stories, had a few refreshments, and were fed an excellent barbecue chicken dinner. (L to R) Bunn's Shane Garrison and Louisburg's Shane Gerald try to gain possession. Ninth-grader Kaylee Saunders (left) is receiving extensive playing time for the Louisburg High School girls basketball team. 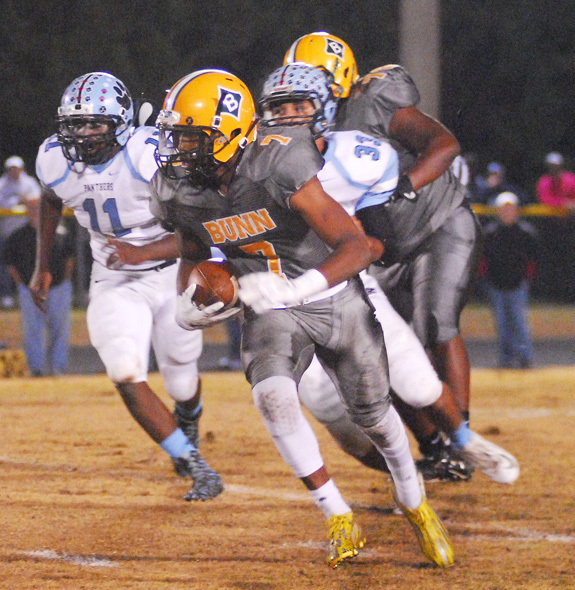 Quarterback Quenten Wright made some key plays last Friday for the Bunn Wildcats during their playoff victory vs. East Duplin. 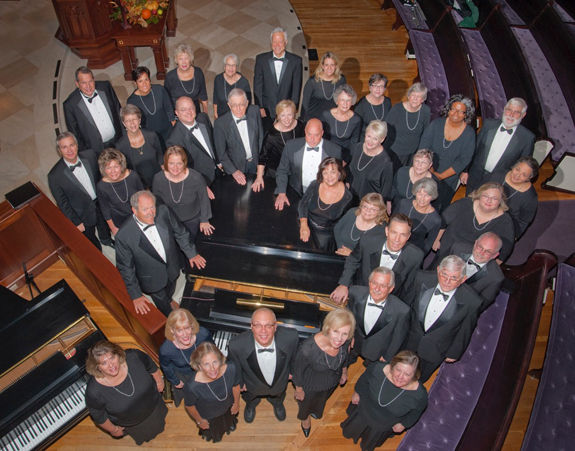 The Northeast Piedmont Chorale is inviting the public to their Christmas Concerts on Dec. 11 and 12. "Hodie! This Day" will be presented twice this season. On Friday, Dec. 11, the concert will be held at 7 p.m. at Wake Forest Baptist Church, 104 E. South Avenue, Wake Forest. On Saturday, Dec. 12, the concert will be held at 7 p.m. at New Hope Baptist Church, 4301 Louisburg Road, Raleigh. For directions to both concerts, visit the Chorale's web site: www.npchorale.org Both concerts are free but donations are welcome. 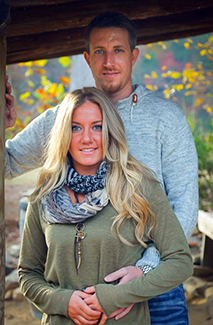 Lindsay Jordan Coffee and Brandon Michael West of Raleigh were married on Sept. 26, 2015 on Memory Mountain at Wolf Laurel, Mars Hill, N.C., 20 miles west of Asheville. The bride is the daughter of Paul and Melissa Burnette Coffey of Franklinton. She is the granddaughter of the late Johnnie and Vivian Burnette of Louisburg and Linda May Coffey of Franklinton and the late Stanley Coffee. The Kenan Fellows Program for Curriculum and Leadership Development at N.C. State University is offering K-12 public and charter school educators the chance to immerse themselves in various fields related to math and science. Educators are selected for the program through a competitive application and interview process. Teachers who have been awarded a fellowship will spend at least three weeks in the summer with an industry or research mentor in order to better align workplace skills with classroom content. November was adoption awareness month and local court advocates received training about agency adoptions. Presenters, Jeanette Richardson of Franklin County Department of Social Services, Kim Denton of the Clerk of Court's office and Pam Taylor of Mercy for America's Children provided information on the procedures and paperwork involved in adoption, recruiting adoptive parents and post adoption support. Guardians ad Litem (GAL), along with an attorney, are appointed to children with cases in court because of abuse and neglect allegations. 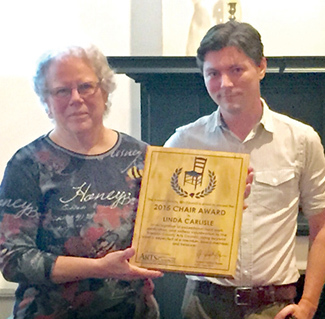 Franklin County Arts Council held its annual general meeting recently at Person Place in Louisburg. After a covered dish supper Pat Noles, FCAC chairperson, opened with a State of the Council address which complimented the board on its handling of the financial struggle caused by the theft of the FCAC funds by a previous treasurer. Noles attributed the financial recovery to a strong board that was willing to work together with the whole membership to carry out the mission of the group. YOUNGSVILLE -- Sewage spilled into a creek recently after heavy rains again overwhelmed the county's wastewater system. The county's Public Utilities staff reported that heavy rains on Nov. 19 caused untreated wastewater from a main sewer line outfall off Railroad Street to empty into a tributary of Richland Creek. The main cause of the bypass is attributable to the direct inflow of stormwater into the sewer collection system, staff said. FRANKLINTON -- A man who apparently violated two relatively minor laws got busted for a major one. Christopher Lee Burroughs was placed in the Franklin County Jail last week on drug charges -- after initially catching the police's attention for littering and not having his moped registered. According to a report by Franklinton Police Sgt. A.J. Bishop, Burroughs, 29, was traveling on Winston Street, approaching officers who were waiting for a wrecker to two a vehicle from an unrelated traffic stop. LOUISBURG -- Franklin County sheriff's deputies are investigating a drive-by shooting reported over the weekend. A man reported to authorities that he was driving home from a club in Raleigh when he was behind a slow moving car on Sims Bridge Road during the early morning hours of Nov. 28. The man told authorities that he went to pass the vehicle and a shot was fired from the vehicle, hitting a passenger side window and the front windshield. LOUISBURG -- Police are looking for a suspect who shot a Raleigh man during an apparent fight. Stanley Davis reported the evening of Nov. 21 that he had been assaulted during a robbery and an assailant shot him in the 200 block of Bunn Road. 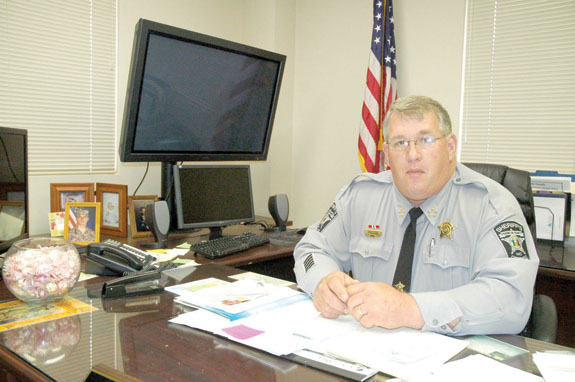 "It was an altercation we're trying to sort out," said Louisburg Police Chief Rick Lassiter. 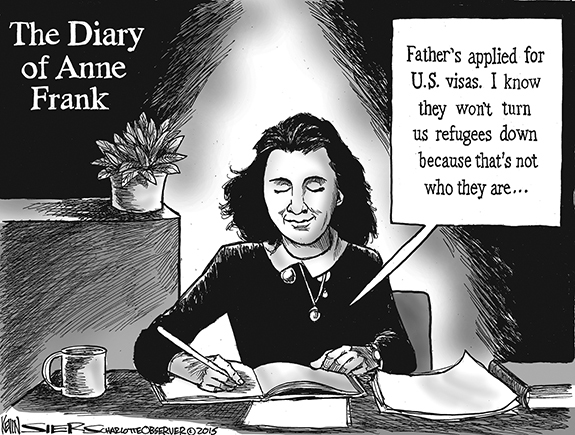 "It was not a random act." YOUNGSVILLE -- Franklin County sheriff's deputies and state agents are investigating the cause of a house fire after finding a body inside. Youngsville, Bunn and Rolesville firefighters responded to a structure fire at 80 Hidden Hills Drive near Youngsville at about 6:30 p.m. on Tuesday to find the home on fire. Once inside, responding units discovered the body of a 29-year-old woman in the living room area. The fire appeared to have started in the kitchen, investigators believe. FRANKLINTON -- Science Magazine ranked Novozymes number one on its recently released annual Top Employers list. The magazine polled employees in the biotechnology, pharmaceutical, and related industries to determine the 20 best employers globally. Novozymes was one of six companies in the magazine's top 20 that did not have a ranking the year before. 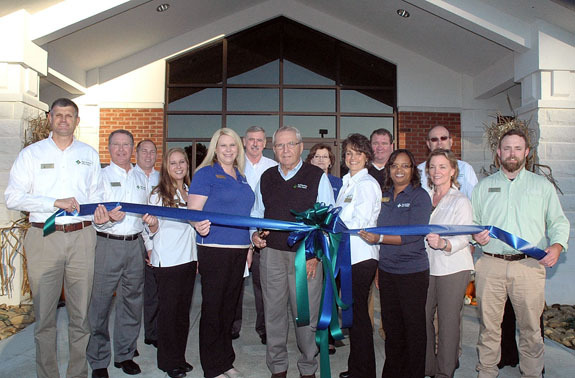 AgCarolina Farm Credit hosted a ribbon cutting at its new site, 1654 N.C. 39 North, in Louisburg, cementing its presence in Louisburg. "Next year, Farm Credit will be 100 years old," said AgCarolina Farm Credit Sr. VP Tim Pace. "For that time, we've had a presence in Louisburg. This just solidifies our commitment to this community. We look at this as the kicking off of the next 100 years." AgCarolina, a member-owned financial services cooperative, is the largest provider of credit to American agriculture. AgCarolina had been at a location on Bickett Boulevard for more than 40 years and a number of renovations, but space restraints made the move necessary. Officials with Citizens Community Bank, Louisburg's newest bank, have announced that the formation of its holding company was completed in November. "We believe this new corporate structure will provide additional financial and operational flexibility, said James R. Black, president and CEO. The reorganization was effected through a share exchange in which each of the bank's common shareholders and preferred shareholders received one share of common stock or preferred stock, respectively, of CCB Bankshares.